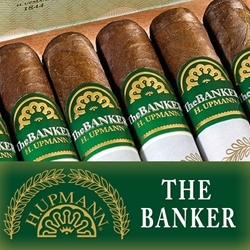 Out from the vault of exquisite premium cigar recipes comes “The Banker” line by H. Upmann. These exclusive hand-rolled premium cigars are the creation of German bankers Carl and Herman Upmann, who while visiting the country of Cuba, created a premium cigar they believed was of such high-quality, it should be saved and put away in vaults and only offered to special clients and their most elite associates. Today, H. Upmann “The Banker” hand rolled cigars are available for anyone who loves and excellent quality smoke at an affordable price. H. Upmann “The Banker” premium cigars are fashioned with a super-dark Ecuadorian Habano wrapper, a Nicaraguan binder from the Jalapa region and filled to the brim with vintage long-filler leaves from Nicaragua and the Dominican Republic. A luxurious hand rolled cigar that burns evenly to the finish, providing a sweet nutty aroma with touches of hazelnut and hints of spicy flavors. “The Banker” line was expanded in 2016 with a special limited release called Ingot “The Banker” Private Holding. Every Ingot hand-rolled premium cigar is packaged in a box that looks like a gold bar, and features each cigar wrapped inside gold foil. Straight from the bank vault, delivered right to your front doorstep! Smokers Discounts has made it easy and affordable to buy premium cigars online. A variety of sizes and flavors are listed below. Each of these styles are in stock and available for a low discount price! Call us for more details!